Winmate announces the first 2 products in the 15" G-WIN Rugged Series that meet the strict requirements of the Railway EN50155 standards. -25~ +60 degrees C and resistance to humidity, shocks, vibrations and radiation in vehicle installations. 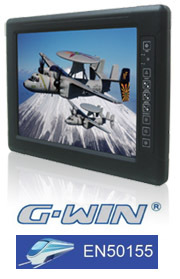 The robust 15" G-WIN Panel PC or Display combines a rugged, but lightweight aluminum-magnesium alloy metal housing with Anti-Corrosion treatments which makes it withstand against rain and dust and seals and protects the Electronics in IP65 standards. To fulfill the EN50155 standard it also has a built-in Isolated power board with wide range power input from 9 to 36V DC, which protects against electronics noise or spikes of up to 1.5 KV. For train applications specially interesting is the Autodimming function, that allows the PPC/LCD to dimm its brightness automatically according to the ambient lights, like in the night or when driving thru tunnels. Various combinations of CPU/LCD or I/O's arte already available. Please ask us if any customizing is requested!